Thanks for the tip, Babe for Food! When Golden Cowrie invited me and two food bloggers for dinner, I was happy they served their bestsellers. 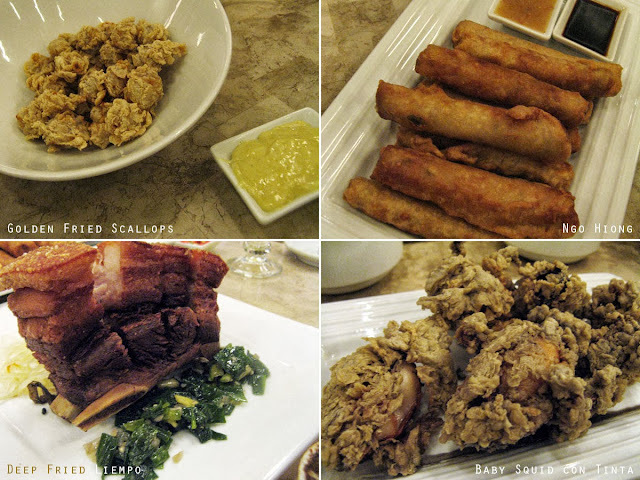 Three of which—sinigang (baby prawns), baked scallops, and crispy pata—never fail to make an appearance whenever my family gathers at Golden Cowrie. It was the first time I had their adobong talong and I'm adding it to my must-eat-when-in-Golden-Cowrie list. 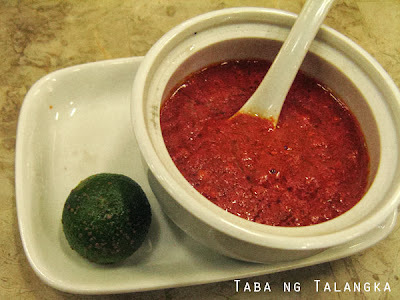 Warning: This small bowl of Taba ng Talangka will require usa ka bandehado na kan-on (a large platter of rice). The good news is Golden Cowrie's rice is unlimited. It's so perfect with rice, you might need to order another Taba ng Talangka. Okay, so all four new additions to the menu are fried. These may not be too appetizing for the health conscious. But I am not one of them (health conscious people). The Golden Fried Scallops are popcorn, according to one of the bloggers. Popcorn can be addicting, so that's probably a positive description. Ngo Hiong (kinda like a vegetable lumpia) is a Cebuano favorite. Maybe I am not a true blue Cebuano for I am not a fan of ngo hiong. The Deep Fried Liempo is, to quote Golden Cowrie, "simmered with local herbs served crisp" (as it should be!). The Baby Squid con Tinta is squid fried in its own ink. Of the four, I like the golden fried scallops best. These 11 dishes make up just a portion of their menu. 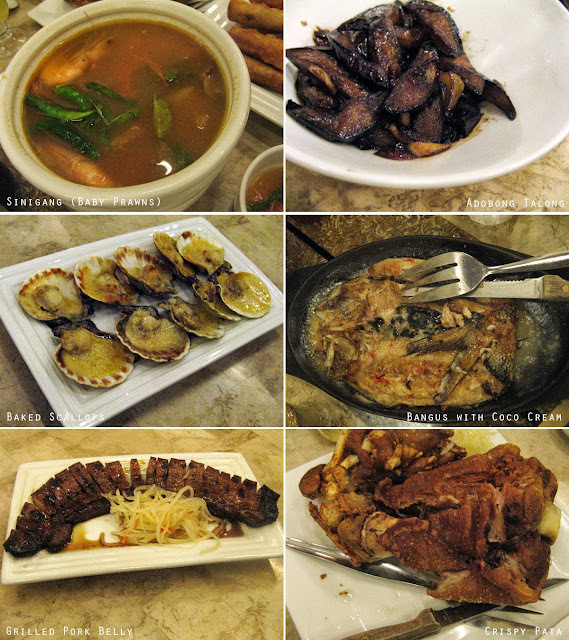 Most of the main entrees range from Php 100 to Php 200; there are a few below Php 100, and a handful above Php 200. Servings are good for two to three persons. Unlimited rice costs Php 39. 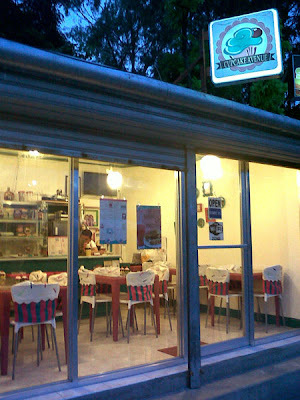 Desserts are also available for Php 35 to Php 95. If you'd like to eat at Golden Cowrie (or Hukad sa Golden Cowrie at The Terraces, Ayala Center), better make a reservation. I guarantee, without a reservation, you'd have to wait and wait and wait for a vacant table. Golden Cowrie/Hukad is always full. 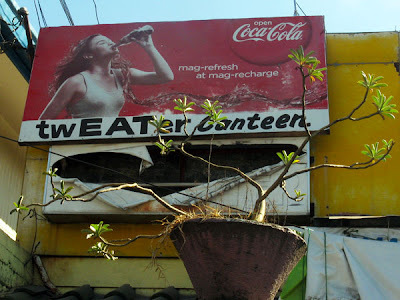 With 15 branches in the Philippines. 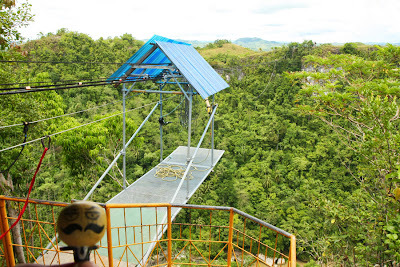 Who would be stupid enough to pay Php 700 to swing and dangle over a 200–meter high and 300–meter wide gorge? Uh...that would be me. Stupid people like me would have to go to Danao in Bohol for this. At E.A.T. 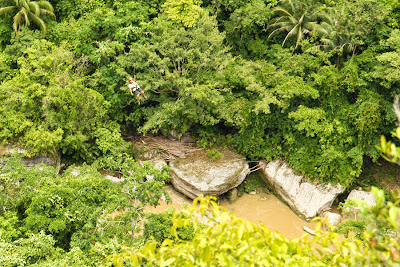 (Extreme, Economic, Educational Adventure Tour) Danao, they call it The Plunge. I call it one crazy jumbo Tarzan swing. 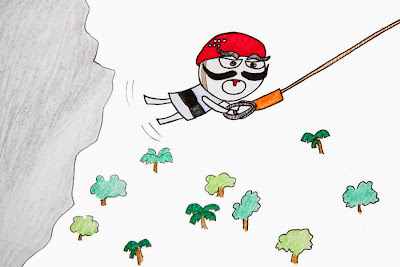 The stupid person gets strapped into a harness, made to walk the plank, secured on the giant swing, made to sit with one's back towards the gorge, lowered down and dangled some meters below the plank, and in three, two, one...released! Free falling, I screamed like a girl. And as I swung to the other side of the gorge, I shut my big girly mouth, spread my arms, laid back and took in the sound and touch of the air as I carved a 100–meter arc thru it. A sublime feeling. A sublime feeling indeed. Regrettably, I don't have a video of that moment when I dropped my 700 pesos into the gorge and left my soul swinging over it. To help you visualize, maybe this video I searched on YouTube will do. Don't worry if you have no one to take photos of you, E.A.T. Danao has an official photographer. Not free. A photo print out would cost Php 50. But if you have a thumb drive or a memory card, you can copy all their photos of you for Php 150. Other activities at E.A.T. 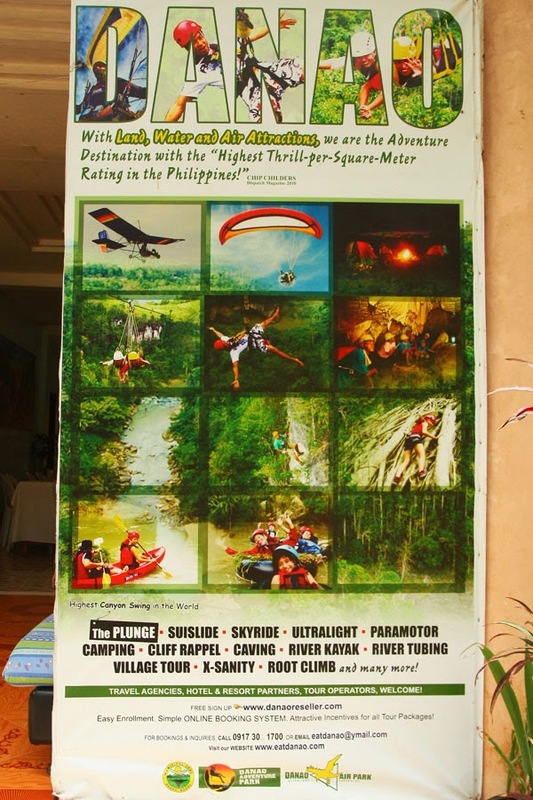 Danao are: ziplining, riding a cable car, rappelling, root climbing, caving, wall climbing, kayaking, river trekking, river tubing, and even flying an ultralight aircraft. 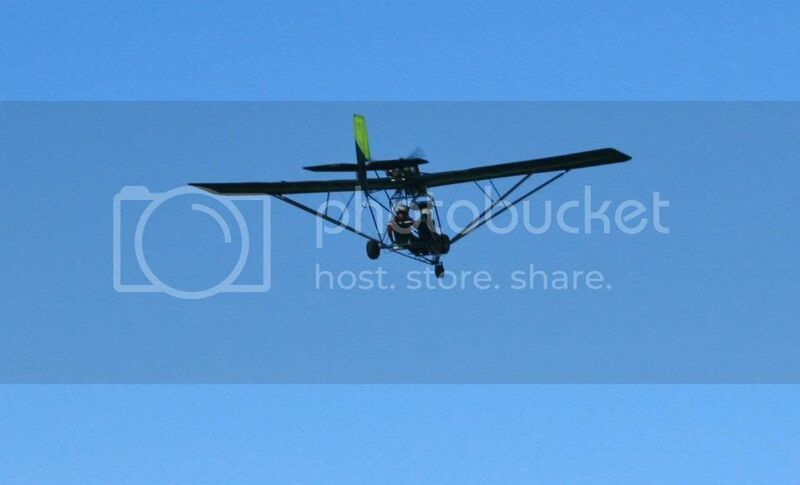 Flying an ultralight aircraft would have been an incredible experience, and an incredible blow on the pocket, too. For Php 2,200 (that's equal to a roundtrip domestic ticket! 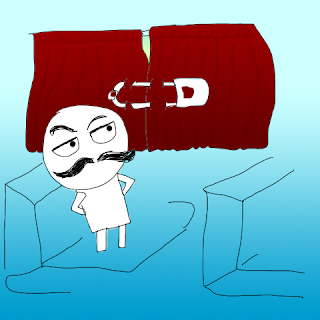 haha) you can be the co–pilot for 15 minutes. Reservation would have to be made at least a day in advance since the aircraft takes refuge somewhere else (I forgot where, but that's what the receptionist told me). Maybe when I'm filthy rich, that will be the next stupid thing I do. The fastest way to get to Danao from Cebu is via Tubigon. Buy a ticket for the fastcraft to Tubigon. The Starcraft ticket booth is outside Pier 3. Ticket prices for Starcraft are as follows: Php200 economy class/Php220 tourist class/Php280 business class. You can find the Starcraft schedule here. Starcraft leaves from Pier 3 (terminal fee Php10). Travel time: 1 hour to 1 hour 15 minutes, depending on the craft. The newer ones are faster. At Tubigon Port, walk (it's just 500m away) or take a tricycle (Php10) to the bus terminal. Look for a bus (Php 30) or van (Php 50) going to Sagbayan. From Danao town, hire a motorcycle to take you to E.A.T. 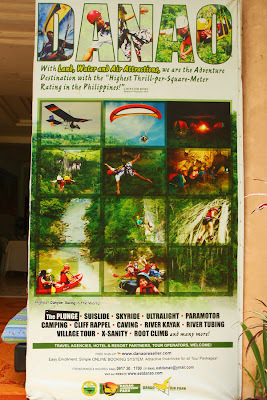 Danao at Php 40 per person. If you miss the bus for Danao and don't want to wait for the next one, hire a motorcycle to take you straight to E.A.T. Danao from Sagbayan proper for Php 150 per person. I went to E.A.T. Danao after visiting Sagbayan Peak. 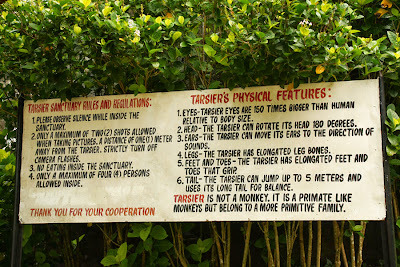 From Sagbayan Peak, I was planning on taking a motorcycle (habalhabal) to Sagbayan proper (Php 20) and following steps 5 and 6 above. Luckily, I was able to strike a deal with two motorcycle (habalhabal) drivers for Php 600 for three passengers (I was with two friends). From Sagbayan Peak, they took us to E.A.T. Danao, then from E.A.T. Danao to Tubigon port. The ride from Sagbayan Peak to E.A.T. Danao took an hour and the ride to Tubigon took another hour. 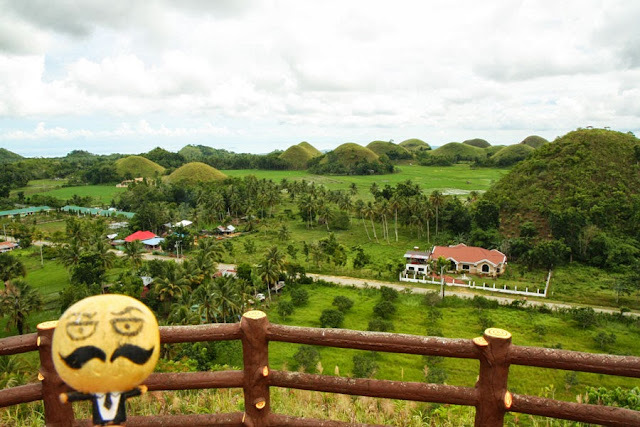 The last time I was in Bohol was in 2007. 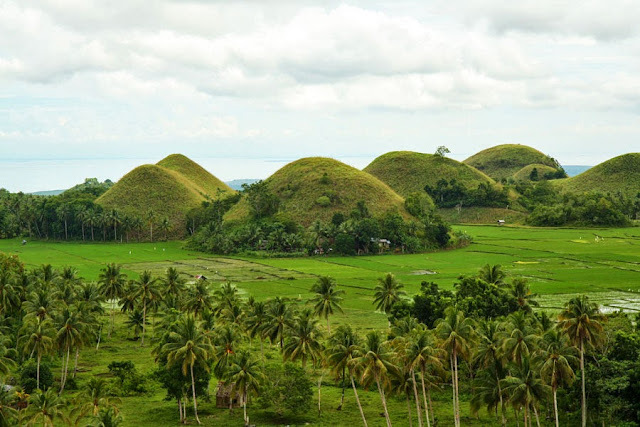 Bohol is just an hour or two away by boat from Cebu and I haven't been back...until July 2013. Why? Because I often take the nearby places for granted. I think, 'It's just a few hours away, I can go tomorrow.' Next thing I know, tomorrow is 365 days multiplied by six plus six months. Six and a half years later, I have eight hours in Bohol and I go to Sagbayan and Danao. 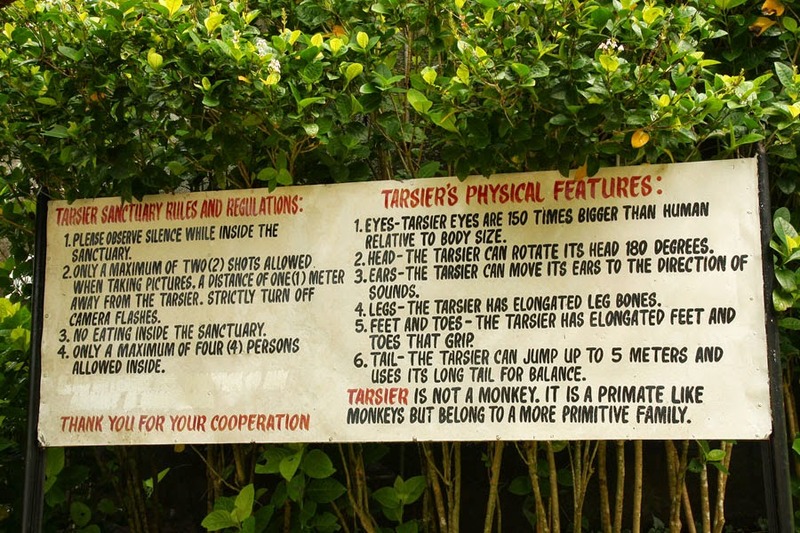 Sagbayan Peak for two things: Tarsiers and Chocolate Hills. Admittedly, the view from Sagbayan Peak is not as spectacular as the one in Carmen. 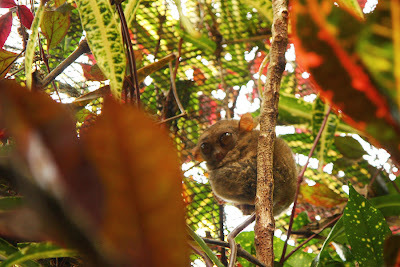 But when in a hurry—Carmen is still an hour from Sagbayan, and Corella, where the Philippine Tarsier and Wildlife Sanctuary is, is about 55km southwest of Carmen—Sagbayan Peak would have to do. Look for a bus (Php 30) or van (Php 50) going to Sagbayan. 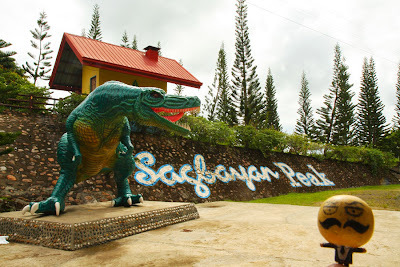 Tell the conductor to drop you off at Sagbayan Peak. From the main road, you can either walk or take a motorcycle (Php15) to the ticket booth at the entrance. Going to the entrance you'd have to take the road (long way). Exiting, you can just take the stairs (short way). No sign at the entrance of EZone that Cupcake Avenue exists...at least I didn't see any. I slowly made my way through EZone with eyes trailed up, looking at all the store signs, and spotted it halfway through the parking area. This sixteen-seater sweet shop is tucked in the far corner of EZone in Panagdait. I could eat the seat covers. Cupcake flavors are lemon, red velvet, banana nutella, triple chocolate, smores, cookies and cream, and choco mallow (Php 49 each). 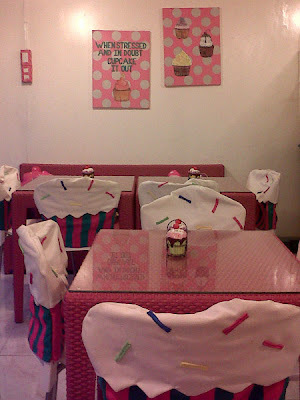 Cupcake Avenue also serves sandwiches and pancakes (Php 60-80), fruit shakes, smoothies and coffee (Php 50-90). Eating alone is no fun. 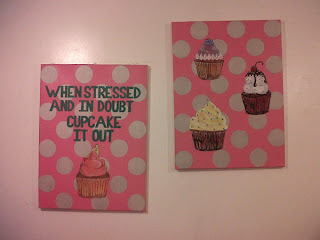 The trouble with going alone is I can't try as many cupcakes as I would like. I only had their lemon cupcake. The cake itself wasn't as lemony as I would like, but the lemony icing made up for it. I have to bring five friends next time and make each order a different flavor so I can get a bite of each. Who wants to go with me? Since I was not looking for a meal, but was focused on trying out just the muffins, I checked the side of the menu listing all the muffins. 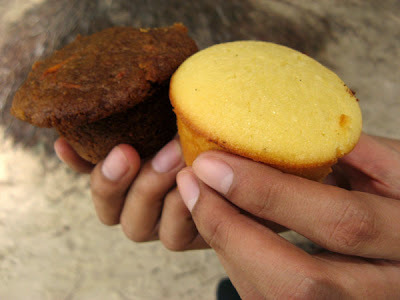 Aside from calamansi muffins, Real Coffee also had banana walnut muffins, carrot raisin muffins, and muffins that rolled the two into one (banana, walnut, carrot, raisin, plus pineapple)—they called it ultimate muffin. Will this blog rave about it? 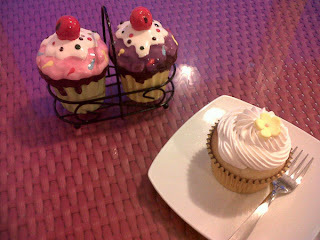 I love lemon cupcakes and their calamansi muffin had the right tang in my opinion. The ultimate muffin tasted just like a carrot cupcake but with extra bits and pieces. For ordinary looking and ordinary tasting muffins, the price is too much. But there was nothing I could do, I was in Boracay. Everything here is expensive. 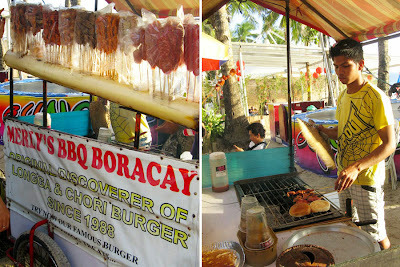 I have often heard my officemates mention the chori burger that they have tried in Boracay. 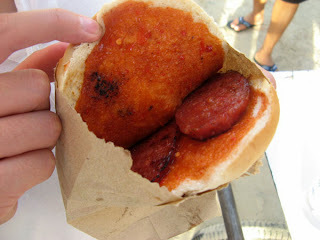 When I came across a chori burger cart, I did not hesitate to buy a chori burger. The power of the word of mouth. Sometimes something so little can be of big importance. Take for example a safety pin. It can be very useful when riding a bus and the angry sun is pouring in through the large windows. 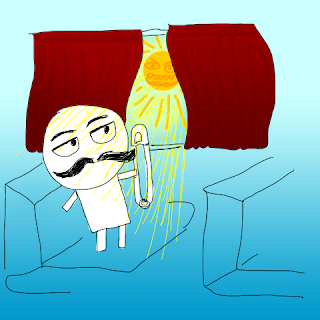 Useful in that it can be used to keep the curtains from letting rays of sunlight peek through. I've added this tiny tool in my travel kit ever since. What uncanny gadget has helped you on your travel lately?